One week after it announced a new set of rules that require mortgage lenders to prove that borrowers will actually be able to pay back their loans, the Consumer Financial Protection Bureau is unveiling a slew of new rules for mortgage servicers intended to curb some questionable practices and provide more safeguards for all borrowers. The first group of rules deals specifically with how servicers deal with struggling homeowners. “Dual-tracking,” when one part of a bank is processing the loan modification paperwork (which always seems to get lost — repeatedly) while another department is moving ahead with the foreclosure action on the same property, has recently been outlawed in California, and the new CFPB rules look to make it a rare situation, instead of the norm. 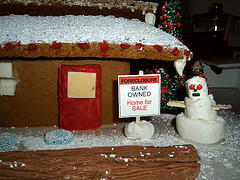 Per the new rules, all of which go into effect in Jan. 2014, mortgage servicers will not be able start a foreclosure proceeding if the borrower has already submitted a complete application for a loan modification or other alternative to foreclosure, and that application is still pending review. Servicers will not even be allowed to make the first notice or filing required for the foreclosure process until a mortgage loan account is more than 120 days delinquent, explains the agency. · Notification of Foreclosure Alternatives: After a borrower misses two consecutive payments, the servicer must provide them a written notice that includes examples of possible options for alternatives to foreclosure, along with instructions on how to obtain more information. · Direct and Ongoing Access to Servicing Personnel: Delinquent borrowers must be provided with “direct, easy, ongoing” access to servicer employees who can assist them. These employees will be held responsible for alerting borrowers to any missing information on their loan mod applications, telling borrowers about the status of any loss mitigation application, and making sure documents get to the right servicing personnel for processing. · Fair Review Process: Some servicers have been accused of directing struggling borrowers into foreclosure alternatives that benefit the servicer instead of the homeowner. This new rule forbids that practice. It also requires that the servicer consider all foreclosure alternatives available from the actual mortgage owners or investors – those with decision-making power over the loan – to help the borrower retain their home. · No Foreclosure Sale Until All Other Alternatives Considered: Servicers will be required to consider and respond to a loan mod application if it arrives at least 37 days before a scheduled foreclosure sale. If the servicer offers an alternative to foreclosure, they must give the borrower time to accept the offer before moving for foreclosure judgment or conducting a foreclosure sale. Servicers cannot foreclose on a property if the borrower and servicer have come to a loss mitigation agreement, unless the borrower fails to perform under that agreement. In addition to the rules specifically aimed at helping struggling homeowners, the CFPB has tightened the reins on servicers in ways intended to aid all mortgage borrowers. · Clear Monthly Mortgage Statements: The borrower’s monthly statement from the servicer must include the amount and due date of the next payment; a breakdown of payments by principal, interest, fees, and escrow; and recent transaction activity. · Early Warning Before Interest Rate Adjusts: For most borrowers with adjustable-rate mortgages, servicers must alert the borrower before the first time the interest rate adjusts, and any subsequent interest rate adjustments that result in a change in monthly payment amounts. · Options for Avoiding Costly “Force-Placed” Insurance: If the homeowner fails to provide insurance on the property, servicers generally have the right to “force-place” a policy of their choosing. These policies are often high-cost but provide less coverage than standard policies. The new rule requires servicers to provide advance notice and pricing information before charging consumers. · Payments Promptly Credited: Once a payment is received by the servicer, it will have to credit the account that same day. For borrowers who make partial payments (ex. $500/week on a monthly mortgage of $2,000), once those smaller payments add up to the total monthly amount, the servicer must credit it to the borrower’s account. · Prompt Response to Requests for Payoff Balances: If the borrower requests accurate payoff balance info, the servicers must provide a response within seven business days of receiving a written request. · Errors Corrected and Information Provided Quickly: Servicers will be required to acknowledge receipt of written notices from consumers regarding certain errors or requesting information about their mortgage loans. Servicers have a given time period — which the CFPB says is 30 days in most cases — to correct the error and/or provide the information requested; conduct a reasonable investigation and inform the borrower why the error did not occur; or inform the borrower that the information requested is unavailable. · Maintain Accurate and Accessible Documents and Information: One of the biggest problems, between the too-frequent hand-off of mortgages and all the bank collapses between 2007 and 2009, was the cluster-frack of paperwork regarding inherited loans. Some servicers could not even provide proper documentation that they even had the right to foreclose on some properties. The new rules requires servicers to store and retain borrower information in a way that allows it to be easily accessible. It must done in a way that allows the servicer to provide timely and accurate information to borrowers, investors, and the courts.